Fully lined black Lycra with pink to blue ombré centre with a cascade of rhinestones all around so y..
Carnival combines mystic, Ombre and lace together with rhinestone resulting in this impressive leota.. Simple mystique V-neck leotard with hundreds of shimmering rhinestones in a range of colours .. Mystic ombre purple to pink leotard with netting top fully lined .. This stunning leotard has a cute open back and contrasting colours to ensure you stand out in the cr.. Elegant fully lined blue ombre lycra with blue mesh lined top finished with an abundance of sparklin..
Sophisticated leotard with lined Mesh top complimented with an abundance of rhinestones. ..
Red white and blue ombré Lycra with black top and sweat heart front design completed with sparkling .. This pretty summer colours leotard is available in cool mint mystique with black mesh or baby pink m..
A simple but effective fully lined printed Lycra leotard with a on explosion of neon colour. ..
Beautiful berry fruit colour ombre leotard moving from blue through the shades of summer berries to .. This is a pretty new cross back leotard in Coral or Teal and finished with laser silver top and cros.. Refreshing ombre white through to green this is a graceful leotard with a burst of sparkling rhinest.. Fully lined white Lycra with a mystical unicorn ombre insert finished with a hot pink V .. This is our new royal blue to lime ombre leotard with the popular racer back. 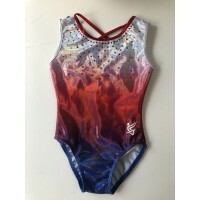 Finished with&nb..
Red white and blue stunning ombré mystique leotard with unique strappy back and a scattering of red,..
Slick black mystique leotard with funky lyrca rainbow top. This version of the leot..
Slick black mystique leotard with funky lyrca rainbow top. Finished with plenty sp..
Our stunning Yasmin leotard combines 3 beautiful materials. With a ombré lycra body, black lac.. Stunning pink ombré lycra leotard with a beautiful printed flower effect which flows into a pr..